The title is not some catchy phrase, but it does describe the names of three top tournaments in progress in Mexico, Moscow and France. Lots of heated chess action! The top venue would be Morelia, Mexico where chess’ top brass are facing off in the Linares SuperGM XXV. World Champion Viswanathan Anand is battling with the likes of Veselin Topalov in what is essentially a Corus “A” field. Corus winners Levon Aronian and Magnus Carlsen will also do battle. So far the tournament is exciting as decisive games are on the regular. The second half of the tournament will be held in Linares, Spain. Aeroflot is one the strongest open tournaments in the world and features some of games rising talents such as Artyom Timofeev, Maxim Rodshtein, Ian Nepomniachtchi, Andrei Volokitin and Alexander Motylev. Veterans in the field include Vladimir Akopian, Viktor Bologan, Alexander Khalifman and Artur Jussupow. A couple of teen wonders are China’s WGM Hou Yifan and GM Nguyen Ngoc Troungson of Vietnam. Hou has had a steady diet of strong showing and will most doubtedly drop the “W” from her title in short time. Capelle La Grande is a huge open tournament featuring more than 600 players from 62 federations and 106 Grandmasters (11 WGMs). This tournament is not particularly strong but it showcases some of the talent that we don’t often hear of. You do have some seasoned players such as Alexander Moissenko and young Azeri star Vugar Gashimov. 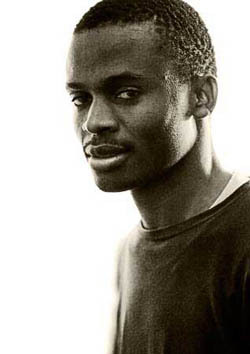 Zambian IM Amon Simutowe is playing as well as American star IM Robert Hess. Simutowe is attempting to gain ELO points in order to close out the last requirement for his GM title. With Topalov’s loss yesterday everyone has lost a game in the Linares tournament. This will be a close tournament, but maybe +3 will be asking for too much??? Anand’s win over Leko was very impressive today. One day I will have to play in the Cappelle La Grande. Gilles Suez-Panama of Martinique had encouraged this but I heard it was an interesting tournament. Those of us in the U.S. need to see the difference in tournaments in Europe. The Middle East has great tournaments I hear. Would like to play in UAE!! Simutowe has played there before. I hope to talk to him soon. 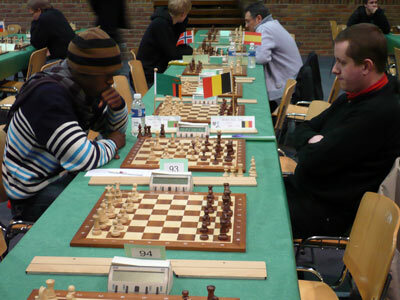 Zambia’s Amon Simutowe is on 5-2 at Cappelle La Grande and is playing GM Lukasz Cyborowski (2543) of Poland in round 8. He beat WIM Vita Chulivska (2291) of the Ukraine. Look through some very interesting games. First, I’ll present the crushing loss of Vassily Ivanchuk to Levon Aronian in Linares. Having outplayed his opponent the entire game, Ivanchuk lapses into time pressure. See Video by Macauley Peterson “When Blunder Strikes – Ivanchuk’s second, Hoyos, and Vassily’s time pressure melt down” @ Chess.FM. Simutowe wins with black against Cyborowski and is on 6-2. The game was a type of Dragon with colours reversed and white played poorly and handed black the two bishops and space. Under immense pressure he sacked his queen, but offered little resistance after that. Simutowe will play Vladimir Burmakin tomorrow. 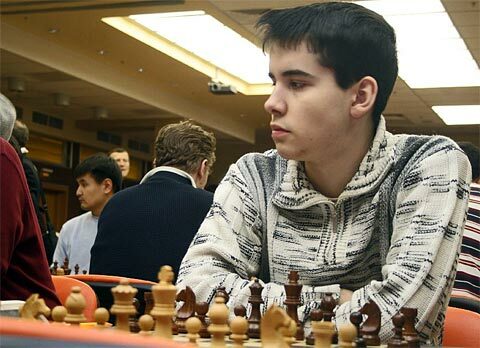 Russia’s 17-year old Ian Nepomniachtchi wins Aerflot! Photo by Özgür Akman. Photo by WIM Anna Rudolf. 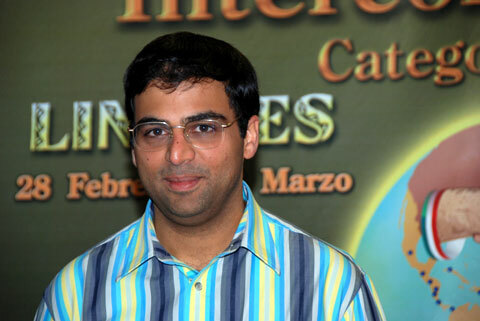 The Linares tournament will resume tomorrow in Linares, Spain with Viswanathan Anand leading the field on 4½-2½. Photo by Frederic Friedel. Daaim – Do you know how many ELO points Amon picked up? The Cappelle site listed his performance rating as 2565. Nice! He picked up about 9-10 points. I believe he needs about 35 more points to hit 2500. With him, Tate and Carlsson in the same tournament, that may motivate him a bit. That is a great thing to see. I wish I were there to see that! I am surprised by Carlsen’s progress as a Grandmaster ,I did not really think he would be a serious contender for tournaments like Linares at this age .This most likely shows how influential computers are becoming ,beating Ivanchuk in that style yesterday was unbelievable .Seems this boy only fears Anand since he has beaten everybody who matters now (Kramnik had a bad cold on d day Magnus won :D).The boy calculates variations fast and accurately . 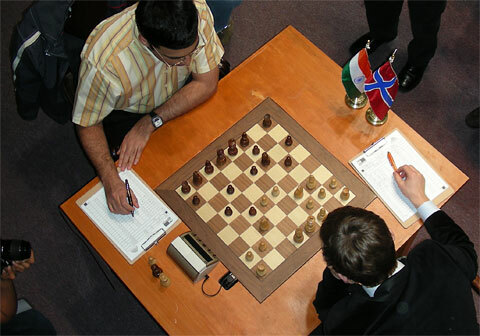 Daaim please I have struggling to get hold of pgn files of a blitz tournament in Reykjavik called Reykjavik Rapid in April 2004 where Magnus had Kasparov on the brink .Karpov also played .The tournament was won by Aronian .pliz can you help?? There is no such thing as “luck in chess, but Ivanchuk gave Carlsen a free game. I’m not sure what his problem is with the time pressure. He had something like 18 moves to make in less than five minutes. You cannot get in that type of pressure at this level. We saw what happened against Aronian! (see video above) I’ll check on that Rapid, but I’m leaving for China in a few hours so someone else may be able to do it before me. Something has gone wrong in World Chess,our masters are losing to kids.Shirov fell victim yesterday yet again. Its time for Leko to play straight for a draw ,I have neva seen him lose so effortlessly ,shocking! !Sometimes everything just goes wrong . Anang equalized effortlessly against Aronian ,I like the way Anand keeps it gangsta simple .I regard him as one of the most logical players I have ever seen,there is clarity when he plays black ,never anything fancy like King’s Indian or Benoni ,simple Nimzo all d time in serious matches. 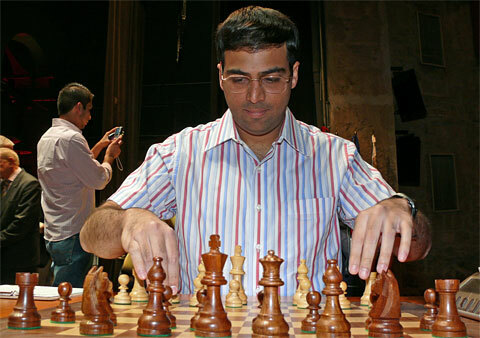 GM Viswanathan Anand, winner of 2008 Morelia-Linares. Viswanathan Anand wins again! Amazing. Amazing. The “Tiger from Chennai” will go down as one of chess’ greatest players. His consistency and simplicity in which he plays is inspiring. I was watching the videos from europe-echecs.com and his understanding of chess is certainly amazing. Also look at his post-mortems with Peter Leko and Teimour Radjabov. He finished with +3 losing only to Levon Aronian. Magnus Carlsen took second in his second impressive outing at the elite level. Of course he had a bit more fortune in his games and benefited from gross blunders from Veselin Topalov and Vassily Ivanchuk. Nevertheless… there is no such thing as luck in chess, so his result is well-deserved. An OK tournament though the games are not as half inspiring as when Garri Kimovich was still playing. Hope we do not wait long though I wonder whats next. Dortmund? Sofia? Connoisseurs of the Marshall gambit, delayed and proper must have been pleased though just like in Wijk. We have seen all sorts of Marshalls including a somewhat shocking one by Leko against Topalov i think. When we were young I remember my Chess teachers did not advise the Marshall after an h3 or d3 by white but seems these dayz d5 gets in anyway. What suprizes me is that Topalov does not grab the pawn immeadiately playing c3 but i see no reason the pawn cannot be taken. My small database shows insufficient compensation if white just grabs the pawn by Ne5 wins by Zagrebelny, Suetin, Gross, Golubev have sort of cemented my belief that the pawn can be taken ,im yet to check Fritz suggestion but i suspect this is possible. I wasn’t excited by this tournament. I believe it was tainted by all the time-pressure induced losses. Carlsen got two wins as a result of opponents time. Topalov was inconsistent and Shirov played well below his level in some games. It appears that the games (while decisive) lacked some of the fire as in Corus. I do like the debate in the above game you mention. I have long lost track of theory in Marshall-inspired lines, but I do like black’s activity. On what move are you suggesting white capture on c3? After 25. Rac1, I believe white has a nice positional advantage. It looks like black gets pressure on the queenside. After 11.Nxe5 Nxe5 12.Rxe5 Bf6. I’m not sure how white would develop the queenside. I would encourage you to search the database and see who has been succesful getting compensation after Bf6 .Any Clue what the top computers recommend ? ?I mean Junior and Fritz. Actually I Googled the line and found a couple of games citing 12…Qd7 and 12…Nd4 when white got no significant advantage. Perhaps if white wants to play for an advantage, 11…c3 is an attempt to free the underdeveloped queenside. Fritz seems to believe that 12…Bf6 also gives black adequate play.